Jazz up your tent on your next camping trip! Power Practical has created the coolest lighting solutions that will make you the envy of everyone who sees them. Luminoodle is a portable, flexible, waterproof rope of LED lights that can be attached to anything using these innovative Velcro ties, slider magnets, and an end, utility loop. They come in bright white or color LEDs with varying lengths and light outputs: 5 feet (180 lumens), 10 feet (360 lumens), 20 feet (3000 lumens). The color versions have 15 color options, 10 brightness settings, 3 white modes, and 3 strobe/fade modes. You can easily control the various settings with the built-in control or the wireless remote. There’s a handy nylon bag for carrying the Luminoodle, battery pack, remote, and other accessories. 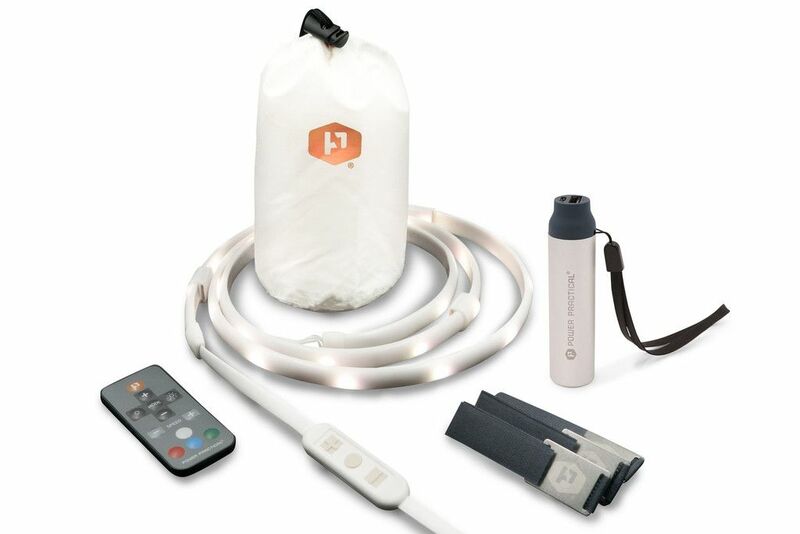 Creatively, that same bag can be stuffed with the Luminoodle and the battery pack to use it as a “lantern”; hang it inside your tent for some ambient lighting. Power Practical also has the Lithium 4400, a compact battery pack and bright flashlight that’s so convenient to carry in your backpack, purse, or pocket for on-the-go power any time you need it. Light up your life with the fun, fabulous, and functional products from Power Practical!